The Toro Co. is celebrating its 100th anniversary of serving the needs of golf course superintendents and greenkeepers. Founded in 1914, Toro brought the first motorized fairway mower to market in 1919. Known as the Toro Standard Golf Machine, the unit was developed for use at The Minikahda Club in Minneapolis. It consisted of five reel mowers attached to the front of a farm tractor and immediately was recognized as superior to horse-drawn equipment. 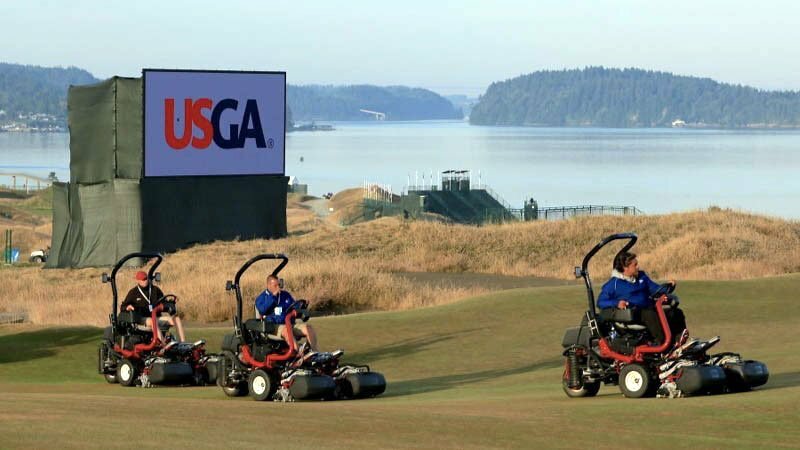 Since then, the company's contributions to the golf business have been well chronicled - and used - with mowers for every applications, bunker-maintenance and irrigation equipment, soil-monitoring technology and more. The company credits its staying power to: listening to customer feedback, innovative products, customer relationships and its distribution network. The Bloomington, Minnesota-based company has a long list of influential employees who have helped it be a pioneer in the golf industry. The company's first president and co-founder, John Samuel Clapper, personally held several patents for golf course equipment, including the first electric-powered (corded) greensmower in 1928. Also on that list is Dr. James "Doc" Watson, who joined Toro in 1952, and is revered as a pioneer in agronomics and teacher. John Singleton joined the company in 1967 and was instrumental in establishing Toro's golf course irrigation division. The company's first president and co-founder, John Samuel Clapper, personally held several patents for golf course equipment. "Without a doubt, we owe much of our success to the Toro employees who have helped shape the golf industry with countless innovations," said Rick Rodier, vice president and general manager of Toro's Commercial Business. "But we wouldn't be here today without the Toro customers across the globe who put their faith and trust in our products every day. As we celebrate a century in the golf industry, we simply want to say thank you to our customers and channel partners for continuing to put your trust in Toro people and products." The company has a long history of serving its community and industry. This year, the Melrose Leadership Academy sent 13 golf course superintendents to the Golf Industry Show. Developed in 2012 by former Toro CEO and chairman Ken Melrose, the foundation that bears his name supports professional development of golf course superintendents based on financial need, volunteerism and desire to advance their careers. Superintendents sent to this year's show through the program are: Dean Chase, Carnegie Abbey Club (RI); Benjamin Culclasure of Kilmarlic Golf Club (NC); Jason Culver of Pine Acres Country Club (PA); Ryan Dykes of Camp Creek Golf Club (FL); John Hardin of Oro Valley Country Club (AZ); Richard Lewis of Willowdale Golf Club (ME); Mitchell Miller of The Dunes Golf & Tennis Club (FL); Manuel Oliveira of Green Valley Country Club (RI); Charles Passios, CGCS, of TGC at Sacconnesset (MA); Patrick Skinner of Brown Acres Golf Course (TN); Douglas Vogel of Preakness Valley Golf Course (NJ); Toby Young of Val Halla Golf Course in Cumberland (ME); Timothy Zurybida of Alverthorpe Park Golf (PA).